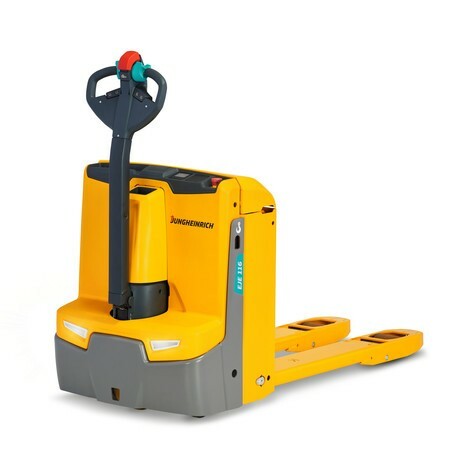 The EJE electric pallet truck is the classic in the range of Jungheinrich pedestrian pallet trucks. The premium product offers outstanding quality "Made in Germany". The latest generation of the EJE is a particularly efficient helper for transporting loads and pallets weighing up to 2000 kg. The Jungheinrich motors feature three-phase AC technology for greater performance with lower operating costs. 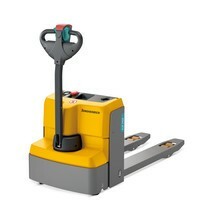 The classic in the range of Jungheinrich electric pallet trucks offers premium quality "Made in Germany"
The electric pallet truck of the Jungheinrich EJE series is the premium product in the electrically powered pallet truck segment. 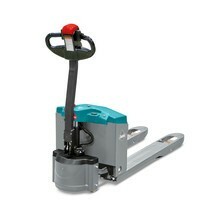 The EJE facilitates accelerated transport of loads weighing up to 2000 kg. The new generation impresses with optimised energy efficiency and greater productivity. The innovative three-phase AC drive motor is maintenance-free and combines enhanced performance with reduced operating costs. 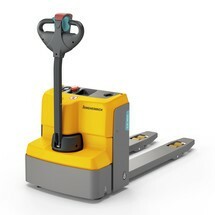 High speeds and powerful acceleration ensure rapid and efficient stock turnover. The on-board charger enables flexible (intermediate) charging of the battery at any 230 V socket. Safety and ergonomics are fundamental in the truck's design. The multifunction tiller head allows you to control the truck with either hand. Intuitive operation is facilitated by a clear switch layout with effective colouring and ergonomic rocker switches, which in turn enable direct control of all travel and lifting functions without the need to change your grip. The sensor system features dust and water protection (IP 65) for maximum resilience and reliability. Comprehensive control instruments (combined discharge monitor and charge status indicator) provide you with a clear overview at all times. The long, low-mounted tiller maintains an optimum safety distance. Even in corners, the EJE is never too close to the operator. The low height ensures an optimum view of the fork tips at all times, thereby preventing collisions with obstacles. Front-mounted reflectors enhance the visibility of the EJE. 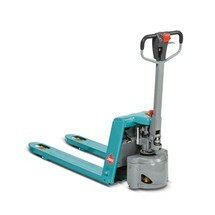 The short 486 mm headlength makes the pedestrian pallet truck extremely agile and compact. It is thus ideal for use in confined spaces and particularly well suited for transport on lorries. The crawl speed button enables safe travel with the tiller raised. At the press of a button, the brake is disengaged and the truck moves automatically at a significantly reduced speed when the travel switch is operated. The sprung and cushioned support wheels are linked to a coupling unit via the ProTracLink traction aid. This ensures excellent stability when cornering as well as on poor, bumpy ground and on ramps. The equalising force is always distributed according to the current travel situation: evenly during straight-ahead travel and concentrated on the outer support wheel when cornering. The fork tips are angled downwards by 3° for easier insertion into the pallet. 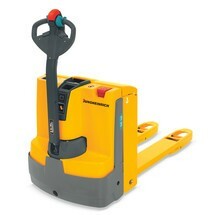 Pallet handling is further enhanced by additional entry and exit aids. The forks feature markings on the tips to assist in the transport of transverse pallets. This ensures optimum positioning of the pallet while also helping to prevent damage. 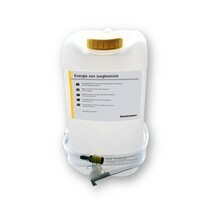 You can also opt for an automatic centralised water replenishment system – known as Aquamatik – for even simpler maintenance: In this case, the battery cells are connected via hoses and supplied by the central water reservoir. In addition to the standard options, we can also offer trucks for longer operating times with battery capacities of up to 375 Ah. We are happy to advise you on the merits and benefits of additional options, with a specific focus on your individual requirements. Contact us at any time!